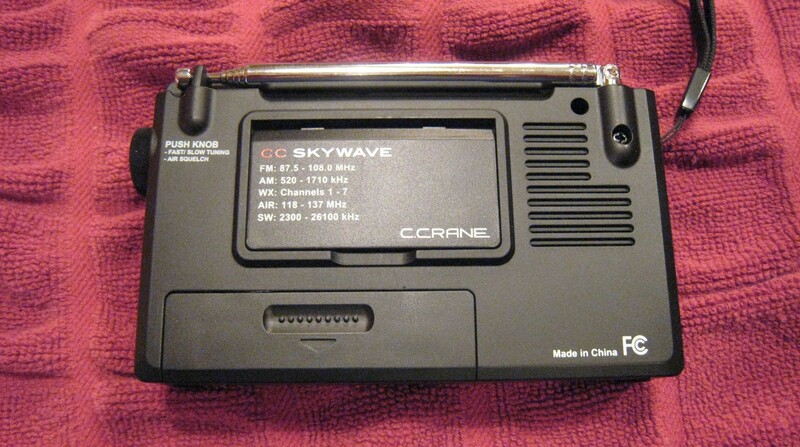 The newest entry to C.Crane’s extensive radio line is the new CC Skywave Radio. 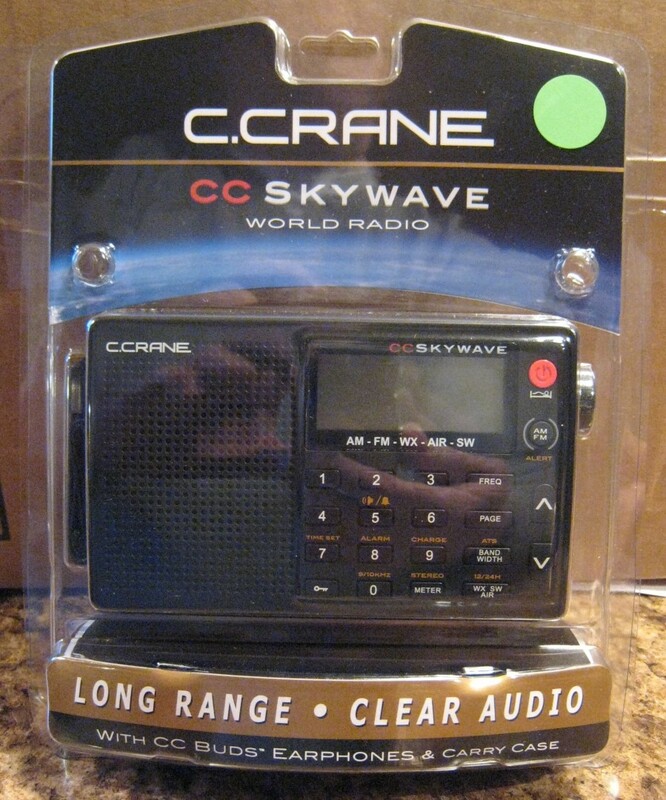 An upgrade to the still available CC-SWP the Skywave covers AM, FM, Shortwave and additionally adds Weather and Aviation Bands and retails on C. Crane’s website for $89.98. Designed as a travel-sized radio it measures a small 4.75″ W x 3″ H x 1.1″ D and weighs 5.5 ounces without batteries yet has unusually wide band coverage making it a uniquely desirable traveling companion. Included are CC Buds earphones, a carry case and an owner’s manual…an AC Adapter is optionally available for $14.95. The Skywave is powered by two AA cells and can recharge NiMH batteries if desired…Lithium batteries are specifically not recommended. 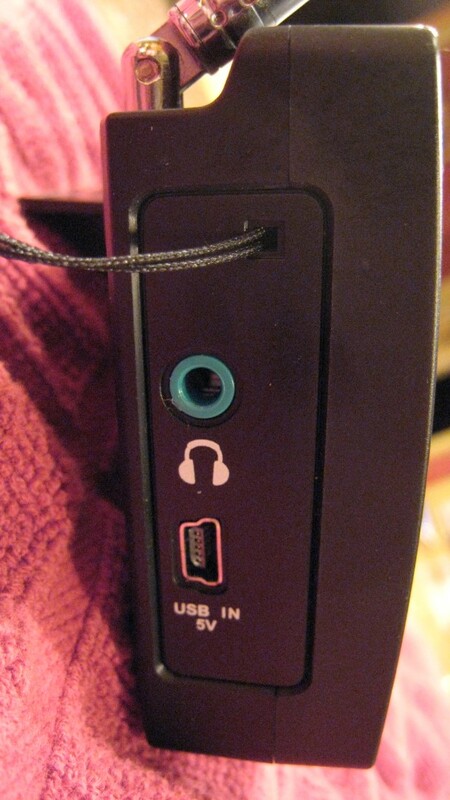 You can also power the radio or recharge NiMH batteries via its mini USB connector but C. Crane correctly advises that most USB chargers and computers, while fine for charging batteries, will generate so much digital hash as to render AM and SW reception noisy when running the radio directly…the available charger is quiet in this regard and thus recommended if you will be powering the radio directly from AC. Also of note: bandwidth options for AM, SW and Air include 6, 4, 3,2 and 1KHz…another product of DSP design and a very welcome addition. The whip antenna is small at 16″. 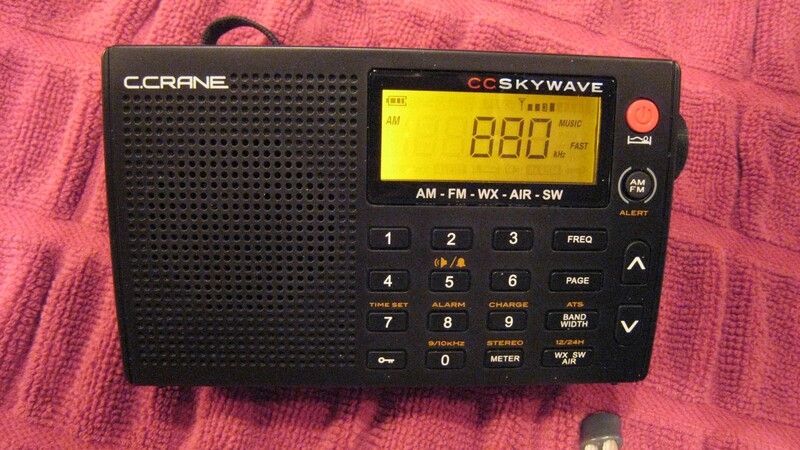 General Design:: The CC Skywave is innovative in many ways, the first being that it may be the smallest radio available that covers not only standard AM and FM broadcast bands as well as Shortwave, but also the NOAA Weather Band and Aircraft Band. Also important – it’s another example of improved DSP-chip-based design. If you’re read other recent reviews you are well aware that these DSP chips are breakthroughs in many areas – especially on the FM band – yet usually sacrifice good performance on the AM band, where their spurious emissions cause interference in the form of hets…whistles and whines which make listening to some signals unpleasant. Evidently the manufacturers are learning how to suppress and shield these noises so AM reception can begin to rival older, non-DSP based designs and I’m happy to say the Skywave is relatively free from any form of “digititus” on the AM band. Yay!!! Press In on the Tuning Knob While In Air Band to turn Squelch Off or On and rotate it to set Squelch Level. Ergonomics & Performance: The CC Skywave is very easy to use…other than some of those hidden functions (most of which quickly became second nature to me) all controls are clearly marked and operate in the expected way. 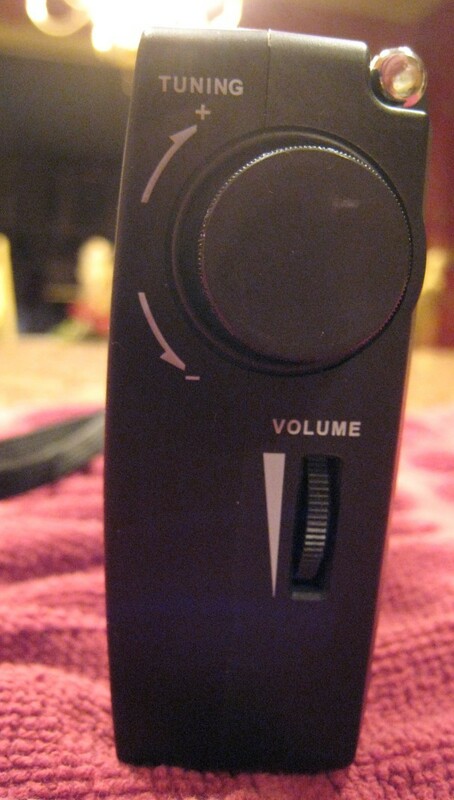 It’s definitely a fun little radio…I especially liked the Fast/Slow tuning function as part of the Tuning knob..it was very quick and easy, I programmed in a few Air Band frequencies from the airport about 12 miles from my house and was able to listen in on conversations clearly and easily. Weather Band Performance was also excellent, bringing in several receivable signals from around the area. It also has “smart” memories which means that presets will remember Stereo or Mono mode on FM stations, as well as bandwidth and Voice/Music settings on AM/SW/Air bands. FM is as good as we have come to expect from modern DSP-based portables, which is to say it was superb…very sensitive and selective. I was able to separate many signals on the Skywave which were unreceivable on several highly respected vintage models…these new FM portables are about as good as it gets on FM reception…most non-DSP equipped portables won’t even come close to this level of performance…especially in terms of selectivity…the ability to clearly separate signals close to each other in frequency. AM/SW performance was very good for this size class radio…naturally the Skywave won’t compete with more expensive full sized portables, but as mentioned earlier it is refreshingly free of any DSP-related digital noises on AM and was a pleasure to use. Few radios this size will match the Skywave’s AM/SW reception. Sound was a bit trebly to my ears but I was able to make it mellower by using the Voice rather than the Music setting…I also tended to keep the bandwidth for AM and SW on 3 or 4 with 6 sounding a bit too bright. But again…for the size one would have to characterize the sound as good and between the Music/Voice and bandwidth settings there is considerable room to tailor it to one’s liking. Conclusion: The CC Skywave Radio is a fun radio to own and use. 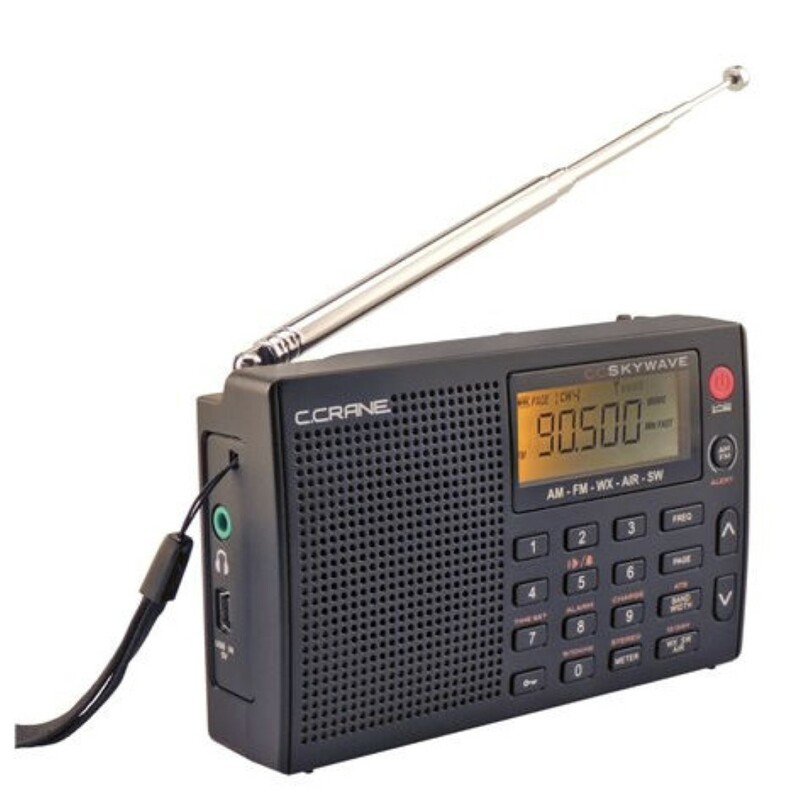 Its combination of great performance, ease of use, small size plus the inclusion of Weather and Air bands in addition to AM/FM/SW make it an unusually useful traveling companion. Highly recommended!